Magpie is a thirteen-year-old orphan chosen by one of the magical Companion horses of Valdemar and taken to the capital city, Haven, to be trained as a Herald. Like all Heralds, Magpie learns that he has a hidden Gift-the Gift of telepathy. But life at the court is not without obstacles. When Mags is "recognized" by foreign secret operatives whose purpose is unknown, Mags himself comes under suspicion. Who are Magpie's parents-who is he, really? Can Mags also solve the riddle of his parentage and his connection with the mysterious spies-and prove his loyalty-before the king and court banish him as a traitor? Can't help but fall in love with Mags, he's a country bumpkin (Like myself) and he finds a place in the world for himself because he's a country bumpkin. I also like how she writes the accents, because yes, that is how we talk sometimes and when Mags makes up a word I can't stop laughing. Dallen is super funny too. Excellent 2nd installment of the Collegium Chronicles. Mostly character development. Very little action until the end. I am a huge Mercedes Lackey fan and the entire Valdemar series is one of my all-time favorites to binge on every few years. I love the story lines, the mystery, the intrigue, the characters. I pick up one of these books and I am transported to a totally different world and I love it! 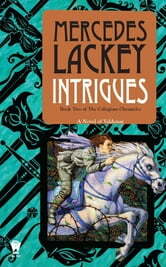 Intrigues is the second in the Collegium Chronicles series and continues to focus on Mags, a former mine slave. I have loved this character from the beginning. He was neglected and abused, as well as woefully under educated, during his years at the mine. He saw things and went through things that would have broken most people, yet somehow his spirit stayed alive and stayed strong. Instead of using his lack of education and lack of knowledge about the world as an excuse to give up or to complain, he finds a way to use it to his advantage. There is an undeniably good message in that. The mystery and intrigue is at high levels in this book, with Mags' past at the center of a lot of it. He is a person without a past. No one knows who he is or where he came from until a foreign operative seems to recognize him. And that moment of recognition puts Mags in the spotlight, and not in a good way. My Recommendation: I love all of the Valdemar books and this one is an important part of the series. Not only does it give some information about the Collegium, it focuses on a character that is different from many of the others that have been the focus of other series within the saga.